When the 81st annual National Juried Art Exhibition opens next week at the Cooperstown Art Association, one of the pieces hanging on the wall will belong to School of Information Studies (iSchool) faculty member Jeff Hemsley. The piece of artwork that Hemsley submitted to the exhibition, “Data Visualization: Steel Links,” is a 3D artistic data visualization that he created from Twitter data collected in the fall of 2011, during the Occupy Wall Street movement. He came up with the idea for the visualization while he was a student working on his doctoral dissertation at the University of Washington. What Hemsley discovered, after playing with some different ways of representing the data, is that there were some things you could see in a 3D visualization that weren’t apparent in two dimensions. In a 2D representation, all the information shown is compressed, and following where the connections go is difficult, Hemsley notes, akin to looking at a pile of spaghetti. After his dissertation was completed, Hemsley set to work on perfecting his 3D modeling. “I used R [a programming language and software environment for statistical computing and graphics] to create the 3D layout, and then exported the results to Blender, an open source 3D modeling program,” says Hemsley. From there, Hemsley wrote some code to to distinguish between different circles and network connections. 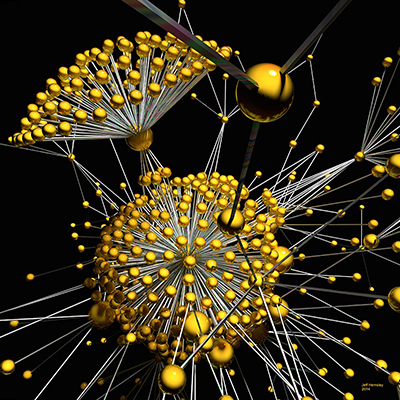 Each sphere represents a person and each link between them is a case where one person retweeted another. Preparation time alone for the print was close to 100 hours, as Hemsley built and adjusted low-resolution mockups. Rendering the final image took nearly 200 hours of computer time and created a file of over 350 megabytes. The image was printed on a 2-foot-by 2-foot piece of aluminum by infusing dyes directly into the metal. At the iSchool, Hemsley teaches a course in information visualization. His piece, and all others shown in the exhibition, will be available for purchase. Hemsley set the price at $1,500. The annual National Juried Art Exhibition is open to artists working in all media residing in the United States. The summer show runs from July 15 through Aug. 19, and coincides with the peak of Cooperstown’s summer tourist season. 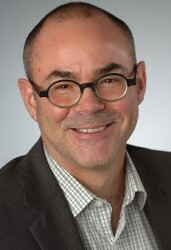 This year’s juror is Peter Russom, a professor of art at SUNY Plattsburgh. For more information about the exhibit, including opening hours and directions, visit the Cooperstown Art Association’s website.